This is a little look at why every time we have an election I get particuarly angry with the lib dems. This is especially for Cllr Luke who really can't stand them and Tom who made the point when discussing the tax plans that we didn't absolutely have to detest the lib dems. This is taken from Antonia's blog. It was used in a recent by election. To paraphrase I think it is an absolute disgrace, I'll explain why later. 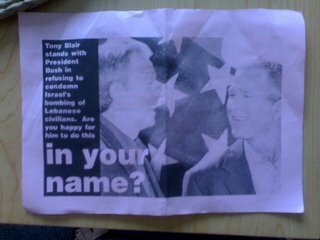 This beats the send Bush and Blair a message leaflets from May. We're all used to the Lib Dems shameless campaigning tactics when they are in opposition; but this takes things to a new level. At the time in Oxford they were in control. Do they really have no achievements to tell people about? Do they really not care about local services. 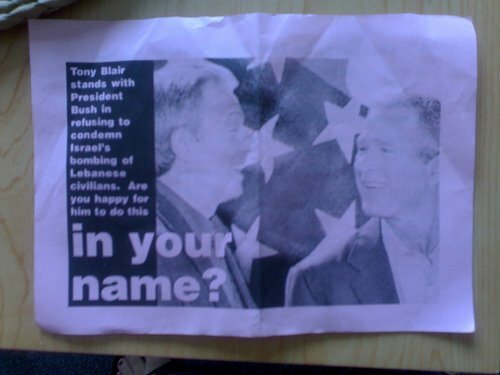 And I'm sorry but the Middle East is not Iraq, this isn't a general election and it certainly isn't an issue to score cheap party political points over. I'm sick of them fighting local elections on wholly irrelevant issues. Incidentally labour won. This was taken from Iain Dale's blog and the Chester anti lib dem site. It just had to be aired because although I have posted on that by election before, the tactics used by the lib dems were vicious, personal and didn't have the slightest thing to do with policy. 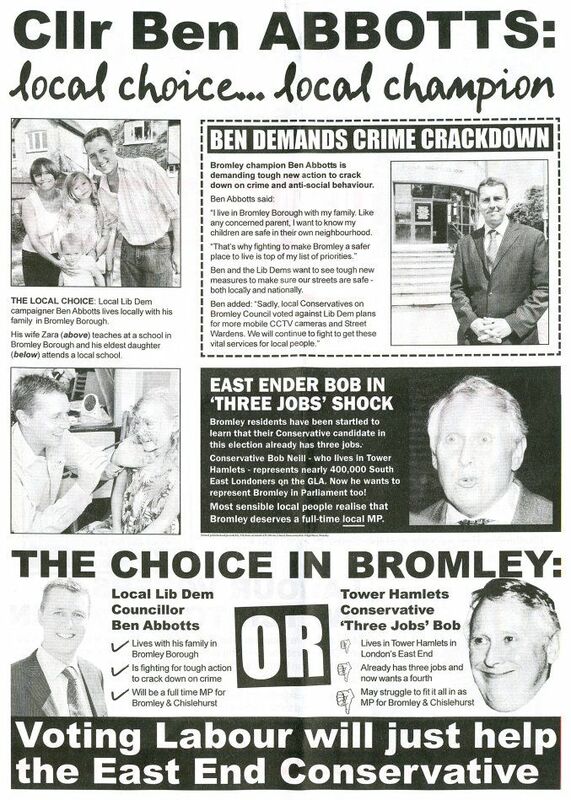 Well thats not what you were saying in Bromley when you put this leaflet out. Its just complete hypocrisy from a party who when it comes to campaigning have no principles. Lib dems lie in Scotland as well . . . . This leaflet put out in Scotland was taken from ridiculous politics. It is insinuating that the Lib Dem candidate will get the decision to turn down an application for a motorway junction overturned. 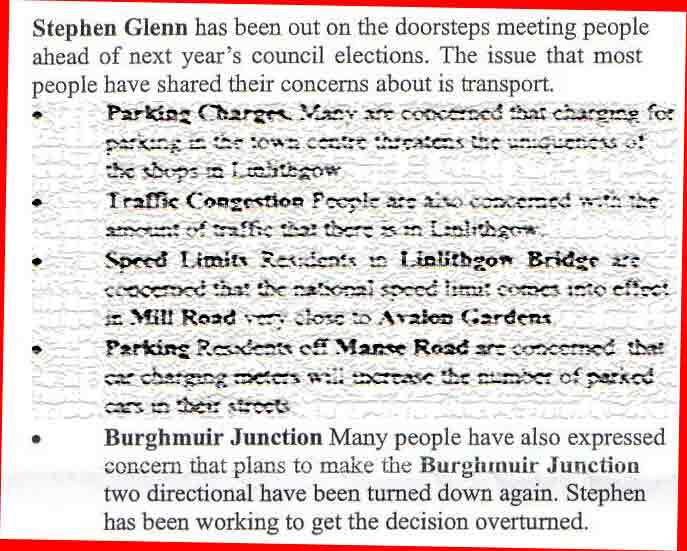 However the junction was actually turned down by the Lib Dem transport minister, Tavish Scot. Dunfermeline and West Fife all over again. Idiots. Fibdems would be more than grateful for more recent examples to show what fibs they are telling voters now. Out of date URL for Crazy blog. Here in Man Wit they've put out a leaflet talking about an overwhelming response to a petition about parking fees ... though they handed in PRECISELY NO NAMES. Thank goodness they didn't get more than none, because more than "overwhelmed" would be very shown up indeed. There's even a picture story on their website showing them not engaging the local people, not getting any signatures, not handing in the petition on the town hall steps. Will blog it soon. I promise. How about the Labour leaflets accusing Lib Dems of being paedophiles? "How about the Labour leaflets accusing Lib Dems of being paedophiles?" Absolute rubbish. Typical Fibber smearing others. All academic now since you stupidly said you'd go into coalition with us. Now you'll be squeezed from all sides. 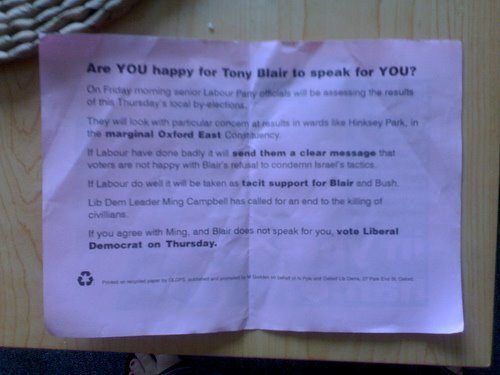 I have heard this before and I have asked a number of times for a copy of a leaflet that accuses Lib Dems of being paedophiles. But not one of you have come forward with the evidence. Perhaps you can prove it but sending a link on here? If not, withdraw the claims. Another Lib Dem gets caught out! Sera Kentman who was elected as WHITEFOOT ward on Lewisham council last May has been expelled from the Lib Dems due to some unanswered questions in relation to her financial situation. The main allegation against her is that she is an undischarged bankrupt, who may have stood illegally at last May's elections. Under section 80 of the local Government act 1972, no one can stand in an election as a councillor if they are an undischarged bankrupt. *A £9,000 ovepayments of housing benefit on a house she part owns. *outstanding council tax payments backdating over a year. *Her use of a number of different names which was publicly highlighted by Insolvency practitioner Keith Stevens who dealt with the case, confirmed a Julia Kilbris, one of the other names used by Cllr Kentman, was made bankrupt in 2004 and is still an undischarged bankrupt. Usually when people declare themselves bankrupt they are automatically discharged from their debts after a year. But Mr Stevens confirmed this one year rule does not apply to Coun Kentman because she has failed to comply with the conditions of a court order made in April 2004. These conditions included meeting the official receivers requests and giving income payments, which was agreed at the time of the order made by Croydon county court. Mr Stevens said:"Based on the picture that he had seen of Julia Kilbris was the same as the photo listed under the name of Sera Kentman on Lewisham council's website. He said: "Based on the picture we have seen , we can confirm she's the same lady who stood for Lewisham council unless she has an identical twin. Cll'r Kentman is now serving as an Independent. A council spokesman said: "We can confirm we referred Cll'r Kentman to the Met Police some time ago. A LIBERAL Democrat councillor has been expelled from the party and is at the centre of a police investigation. Cllr Sera Kentman, who has represented Whitefoot ward in Lewisham since last May, was axed after breaching rules, which included failing to disclose her debts as a councillor. News Shopper can reveal Ms Kentman is an undischarged bankrupt, who may have stood illegally at last May's elections. Under Section 80 of the Local Goverment Act 1972, no-one can stand in an election as a councillor if they are an undischarged bankrupt. A £9,000 overpayment of housing benefit on a house she part owns. Outstanding council tax payments back dating over a year. Her use of a number of different names. Ms Kentman was temporarily suspended three weeks ago from the party and given time to provide information on her debts and proof of her identity. But on March 8, at the Civic Suite, Catford, she failed to provide the group with any evidence to clarify her status. Mr Morris said: "We have given her time to come to meetings and provide us with information. She has not done anything. "We have a rule book and she has breached it. We had no choice but to expel her from the group. "She has been evasive to her own fellow councillors and is not fit to be a Liberal Democrat councillor or any other councillor of a political party." A police spokesman said they were not able to comment on the nature of the allegations while enquiries are continuing. Insolvency practitioner Keith Stevens, who dealt with the case, confirmed a Julia Kibris, one of the other names used by Cllr Kentman, was made bankrupt in 2004 and is still an undischarged bankrupt. But Mr Stevens has confirmed this one year rule does not apply to Cllr Kentman because she has failed to comply with the conditions of a court order made in April 2004. These conditions included meeting the official receiver's requests and giving income payments, which was agreed at the time of the order made by Croydon County Court. The Individual Insolvency Register lists Sera Kentman and her alternative names, Julia Kibris, Hulya Kibris, Feliz Guner, and Hulya Guner. Mr Stevens confirmed that a photograph he saw of Julia Kibris was the same as the photo listed under the name of Sera Kentman on Lewisham Council's website. He said: "Based on the picture we've seen, we can confirm she's the same lady who stood for Lewisham Council unless she has an identical twin." Cllr Kentman is now serving as an independent. A council spokesman said: "We can confirm we referred Cllr Kentman to the Met Police some time ago. "We are not able to give additional information while the investigation is ongoing, nor can we speculate on any action following the investigation." 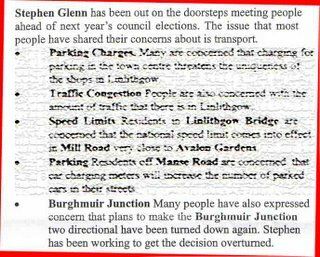 News Shopper has been unable to contact Cllr Kentman. sorry - crap link. Here is the full story on the mire Lib Dems lies.